About four years ago, locals who work on building and maintaining trails, and those who love to hike, bike, commute and ski on those trails, starting meeting regularly to discuss how to grow, connect and support a trails system in Bonner County. The group called itself Trail Mix, adopting the name of a similar committee in Moab, Utah, that’s expanding a world-class trail system there. Here, the group is a mash-up of nonprofit and user groups — like the Backcountry Horsemen, Panhandle Riders and Sandpoint Nordic Club — the cities of Sandpoint and Ponderay, the county, and state and federal agencies that are all collaborating on how to improve our trail system. While the mission and focus of the members of Trail Mix differ, everyone who participates considers trail development a worthwhile endeavor. And why not? Trails contribute to public health, improve the quality of life for people who live near them and boost the local economy. Trails in cities give residents an alternative to jumping in their car to run an errand or visit a friend — so they can help relieve traffic and improve air quality, too. Trails also are good for business, according to a study published in August 2018 by Headwaters Economics. The research group found that recreation opportunities in Bonner County help recruit and retain employees, and that expanding the county’s trail system could significantly increase spending by visitors to the county and bring anywhere from 12 to 72 new jobs to the area. With the help of a technical geographic information systems team from the Trust for Public Land, Trail Mix spent many months developing a plan for the county, called the Bonner County Trails Plan, which was completed in 2016. The plan envisions an expanded and diverse trail network that connects the urban to the rural areas and connects us to recreational opportunities and natural landscapes “from waterways to wilderness.” This trail network ideally would be cherished and well-cared for by the users and communities. The plan includes maps of existing trails and a wish list of priority projects, some small and some large, such as the Watershed Crest Trail, the Pend Oreille River Passage Trail, and connecting the Pend d’Oreille Bay Trail to the neighborhoods of Ponderay. The plan, while never formally adopted by the county, has provided a framework for trail development connecting the cities in the urban core and expanding the recreational trail systems in the county. Since the plan was published, Trail Mix has continued to meet and discuss trail projects every other month, sharing information and ideas for funding, occasionally resulting in new projects. 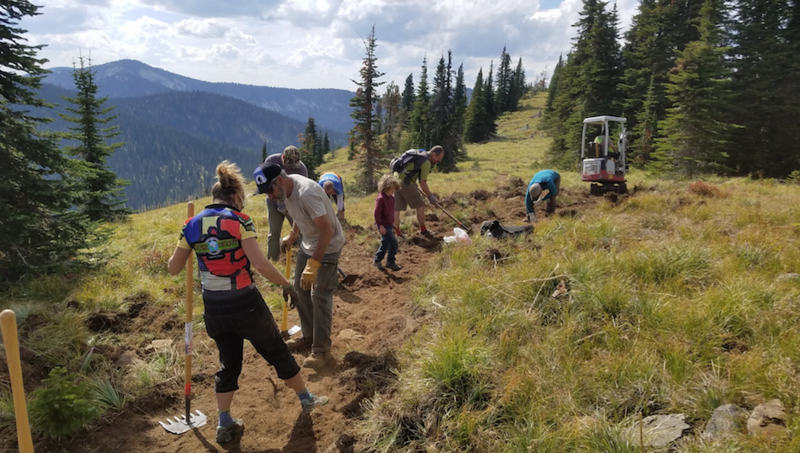 A subset of the group is working with the Forest Service on a new non-motorized trail for Packsaddle Mountain, for instance. Trail Mix also is collaborating on a trails website that will feature existing trails with trail maps and also share information about the trails plan and organizations that are helping to implement it. This is partly to address a need identified in the plan — to better share information about existing trails in the area for visitors and residents alike. As part of that outreach effort, Trail Mix is also launching this “Trail Dispatches” column, which will be written by various Trail Mix members. The idea is to feature different trails and trail projects to foster appreciation for what’s already available and learn about what’s in the works. Now that it’s been almost three years since the plan was created, Trail Mix is updating it. The Pine Street Woods property was not considered a possibility at the time, the proposed Watershed Crest Trail route has changed, and other paths have taken new turns, too. Stay tuned for more news and information about your trails here. Trail Mix meetings are open to the public and are typically held at 1 p.m. on the fourth Thursday of every other month —beginning in January — in the Bonner County Administration Building. To read the Bonner County Trails Plan, visit www.tpl.org/bonner-county-trails. Susan Drumheller is president of the Friends of the Pend d’Oreille Bay Trail and is self-employed as a grant writer. She serves as secretary for Trail Mix.